The past few years have been pretty good for MLB The Show. About halfway through the lifecycle of The Show 15, Sony San Diego released a patch that significantly cut loading times for the game, which was a much needed fix. In The Show 16, the game began to step away from its roots as a punishing, frustrating series and make itself friendlier to casual players. And in The Show 17, Quick Manage mode made it easy to cruise through a season without losing motivation. The problem with having such a consistent rise in quality is that when you have a year that treads water or makes a few tweaks that don’t work as well, those shortcomings are magnified. As such, this is the first time in a few years that I wouldn’t recommend to upgrade from the previous edition - unless you’re hungry for a roster update. There’s still a lot to like about MLB The Show 18 - you can still import saves from previous entries, you can still move through season in Franchise mode easily, and baseball is a still a great sport. When it’s clicking, The Show is still one of the most rewarding sports games to play. The difficulty and unpredictability of the game makes the successes feel all the greater. You can have your timing down and find the right pitch, but the result can still be a ground ball to shortstop or a line drive hit directly to the first baseman. I know that sounds frustrating, but it makes the success so much sweeter when you rocket an extra base hit to the gap or connect on a deep home run. The same is true for pitching. When you are spotting your pitches to perfection and dealing consecutive no-hit innings it feels excellent - but finding that groove with The Show is more difficult this year. And yet surprisingly, of the bigger issues with The Show 18 is how it plays. Sony San Diego has spent years tweaking and reconfiguring the way their baseball simulation handles and not always for the best - fans of series will remember experiments like pulse pitching or analog stick hitting. It’s made it difficult to pin down the definitive control scheme for the series as it largely depends upon when you started playing the franchise. In last year’s game, I thought the developers had come up with the best solution possible: have everyone start the game by playing around with the different controls until they find something that works for them. 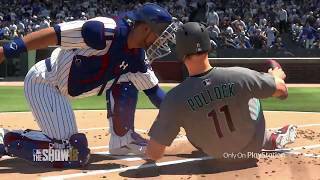 The game’s desire to make itself user-friendly was a smart one, but The Show 18 has moved away from the vision of adjusting itself to the player. There are still options to customize the controls, but they’re harder to find, harder to understand, and the game punishes you for selecting certain options by giving you less experience points to level up your profile. The options also feel less robust. I couldn’t figure out how to get the right set up for myself and some of the options had obtuse descriptions. It was pretty frustrating and felt like a step backwards. My other, less serious qualm comes in Franchise mode. The mode is still solid. It’s fun to take a mid-market franchise like the Mariners or my own Minnesota Twins and add the few missing pieces to turn them into a legit contender while watching the talent already in place grow and evolve. It’s equally fun to jump on a big money team like the Red Sox or the Dodgers where you have tons of money to play with and can make big-time free agency signings. The complexity of MLB free agency and minor league contracts can be tricky to follow, but if things go south you can always just hop to a different team at the end of your contract. New for MLB 18, each calendar year has been separated into phases, the longest being free agency, which has about five different phases to it. The intention behind this change is good, as phases help you understand where you’re at in free agency and what actions you have at your disposal. The bummer is the re-tooled interface that makes it difficult to find certain options. At one point I had to let the CPU handle signing a third-base coach, because I couldn’t figure out where to do so in the menus. And while this mode was clearly created to help, the complexities of MLB free agency are still a headache with the ins and outs of player contracts being as complex as ever. It’s also still annoying to have to re-sign every single player in the minor-leagues to one-year contracts - and I wish that the game had an easier way to help give you control over the team without getting buried in menus. I’m also still not fully on-board with this new Road to the Show mode. A new addition to the mode helps make it a little more interesting as you’ll be able to pick a player archetype early on. So if you want to be a Power Corner or Gold Glove specialist, you can get a head start on the skills needed to fill that role. Depending upon the type of player you pick, you’ll receive a significant boost to certain stats; a Power Corner is going to be slow and not great in the field, but they’ll be able to jack more home runs. This means you don’t have to spend hours trying to grind out certain improvements. You also no longer have to play mini-games to improve your stats. You just pick which activity you want to do on the off-day and the player will receive an incremental boost to those stats. It all is in favor of a little less grind. The narrator still sounds like they’re doing book-on-tape auditions for the most boring baseball biography of all time. The mode also presents the illusion of choice to make your player have some personality but the choice is usually: do you want to play or do you want to be benched? There’s also a disconnect between the in-game management and the clubhouse management. For example, the manager brought me in to talk about how I’d been thrown out trying to steal a few times and told me to stop stealing. Then in a game, he gave me the signal to steal during a game, so I tried to steal and was thrown out. Then I ended up getting benched because the manager said I was supposed to stop stealing. That disconnect is annoying, but the greatest flaw with the mode is that it’s just dull. I tried something new this year, playing shortstop, thinking that an infield position might be fun - but it wasn’t. There are a lot of fielding scenarios that are just covering a base or being the cutoff guy, which make you wonder if it's really important for you to play them. When the ball is hit at you, you have about ten seconds to make the vital decisions about whether you’re going to dodge right or left - that’s it, that’s fielding. There also isn’t any customization to your player’s personality. You can be standoffish or a showboat, but you’ll immediately get benched, which means you’re just simming through the game. A lot of work is going to have to go into this version of the game before it can find its stride. The last big mode is Diamond Dynasty where you create a team and play in endless ranked seasons to level up your squad, get better players, better equipment, and better rewards. A lot of these rewards are just items that show off your accomplishments, cosmetic items to prove your ability as a player. The mode itself feels like a catch-all way to make sure that you will never have to stop playing The Show. There are constant online ranked matches, a conquest mode as you attempt to play different AI teams and win more fans, and specific challenges to help you earn legendary player. 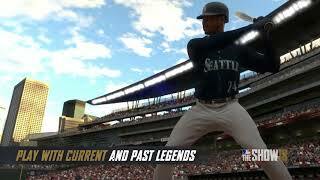 But there’s no escaping the fact that Diamond Dynasty lives and dies by how good the gameplay is. If you like the simple act of playing MLB The Show, you’ll likely love this mode because it gives you half-baked reasons to keep loading up game after game, but since this is my least favorite version of the gameplay in a couple years, I couldn’t get into this. I’m not a big fan of these modes anyways, but this year I was particularly turned off. There are a ton of other ways to play The Show. The retro mode is back, though if you played it at all last year, you probably got your fill. You can still play exhibition games and online matches. The online gameplay is very solid. I noticed a couple of hiccups, but the connection was pretty strong throughout. The online gameplay actually offers the most robust of the customization options as you can use gameplay settings to try and locate players with the same control schemes. If you have peculiar taste in how to play The Show (I doubt anyone wants to play with the analog stick hitting), it might be hard to find a game, but it’s nice that the game offers a way to match you up with people of similar tastes. I’ll also give a quick shout out to the player customization options, which continue to be cool. There are a lot of details you can alter and it’s easy to see how no two players could look alike. Importing music cues is still quick and easy and add a wonderful personal touch to the game. 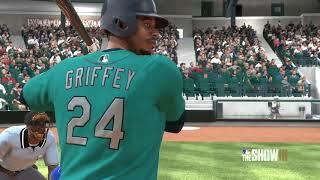 I’m still just holding out for the day when MLB caves and allows custom teams in Franchise mode again. Technically, The Show is still a powerhouse. There hasn’t been a significant upgrade to the look of the game this year, but I still would say it’s the best-looking sports game. The fact the game can create such impressive technical visuals with such short loading times is still fascinating. The color commentary and TV-style presentation are still a little rough, though. I love Matt Vasgersian and his play-by-play voice, but the game lacks some flourishes to distinguish itself. Everything is too mundane - and I guess when you have a 162-game season, that’s bound to happen, but we’ve been waiting a decade for something more creative in the presentation department from this franchise. MLB The Show 18 is a good game. The tweaks over the last couple years have ensured that there’s a solid foundation to work from, but this year’s offering is so sparse in its improvements that I have a hard time recommending it over last year’s version. If you simply have to have the newest iteration of The Show, this one is totally serviceable, but if you’re new to the series and are wondering where to start, or if you’re still playing your copy of The Show 17, you can stick with last year’s version. MLB The Show 18 looks phenomenal, as it always does, but the TV-style presentation is still lacking. If you dig through the menus you can tweak The Show 18 to fit your play-style, but it’s a lot more cumbersome than in the last game. Even then, it never quite felt right to me. The changes to Franchise mode feel like a step backward and Road to the Show is still a slog. Meanwhile, Diamond Dynasty lives and dies by the gameplay and that isn’t as strong this year. The ability to find people playing the game the same as you is pretty neat and the connection was always solid for me. The ideal way to play this year’s game might be to just sink hours into Diamond Dynasty ranked online matches. It’s still shocking how good this game looks and how smoothly it runs. It’s the most technically competent sports game you’ll find. I don’t think MLB The Show 18 is as good as last year’s game, but the improvements over the last two years are solid enough to carry the franchise momentum forward. Hopefully, next year's version will get back to the winning ways and bring more substantial changes. MLB The Show 18 is ranked #792 out of 1434 total reviewed games. It is ranked #50 out of 146 games reviewed in 2018.